It was on a balmy Sunday evening that we headed to the Roseland Peninsula for the sixth Lumia Live Session. 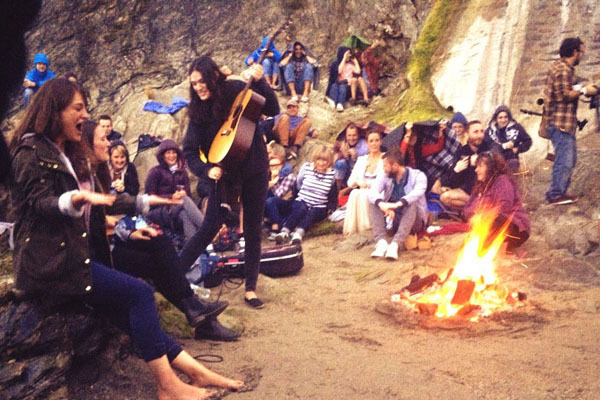 These pop-up musical events are part of a collaboration with the achingly trendy La Blogotheque and are all about live music in unique and unexpected locations. 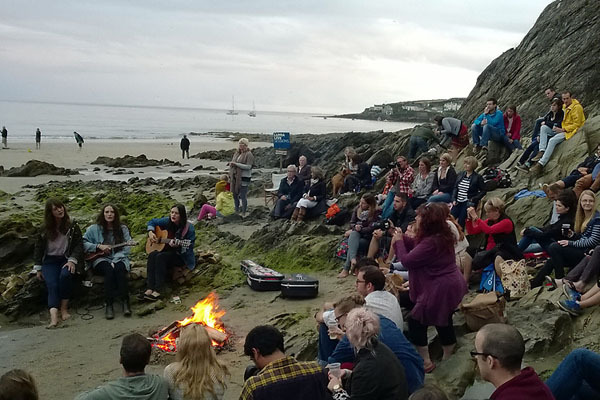 Previous venues have included a skate park and a cemetery and so this is how we found ourselves listening to one of the UK’s hotly-tipped folk trios unplugged on Porthcurnick beach. 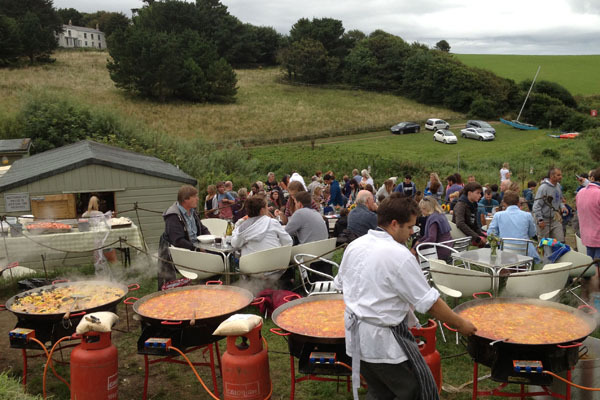 The event was held at The Hidden Hut (now famous thanks to ITV’s Cornwall with Caroline Quentin and several broadsheets), and coincided with one of their fantastic feast nights. 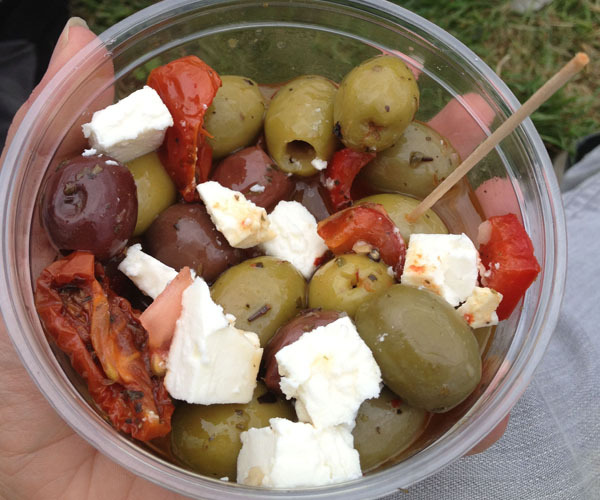 Children and dogs ran riot and conversation bubbled as we nibbled on snack pots, red wine and beer. Before us, an army of chefs stirred big steaming pans of paella, slowly adding chicken, chorizo, prawns, mussels and calamari. When the dinner bell sounded, we joined the orderly queue. Then, armed with our cardboard box full of paella, we sat down and tucked in and boy was it delicious! Once fed and watered, we waited for an announcement. Where would they be playing? In the kitchen? On the roof? As some rather ominous clouds began to gather it came. 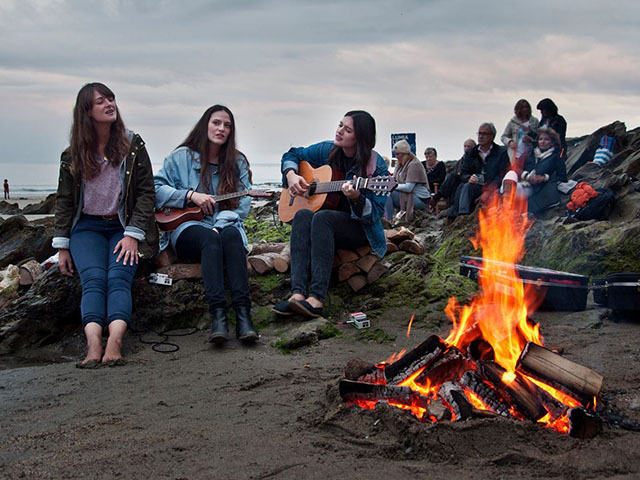 “The Staves will be playing on the beach in about five minutes.” Removing shoes and socks, everyone gathered their belongings and trundled down towards a cove where a roaring fire set the scene for the acoustic set of all sets. I’ll be honest, I didn’t see Emily, Jessica and Camilla Staveley-Taylor play at Glastonbury. I usually like my music with a little more beat, but they really were lovely. Dark haired and pretty, they sat down on some rocks without any fuss at all and simply began to play. No amplification, just an acoustic guitar, a ukulele and their dulcet tones. Their voices were pitch perfect and to me they sounded like an English version of the Australian Rock folk band The Waifs. As they urged the crowd to come a little closer so we could hear them over the sound of the waves (and the family playing beach cricket) it really did feel like we were part of something very special and intimate. Sadly it was all a little too good to be true, as mid way through ‘Mexico’ the heavens suddenly opened. This wasn’t just drizzle either, this was proper torrential rain. We were in Cornwall after all, so most people had come armed with rain paraphernalia. Others grabbed ponchos from the organisers or sheltered under whatever they could. I found myself under an Indian rug held aloft by strangers. With the rain showing no sign of abating and the Indian rug beginning to drip, I decided to hot foot it back to the car. Those that did stay were treated to more music although the beach side location was abandoned in favour of a gazebo. 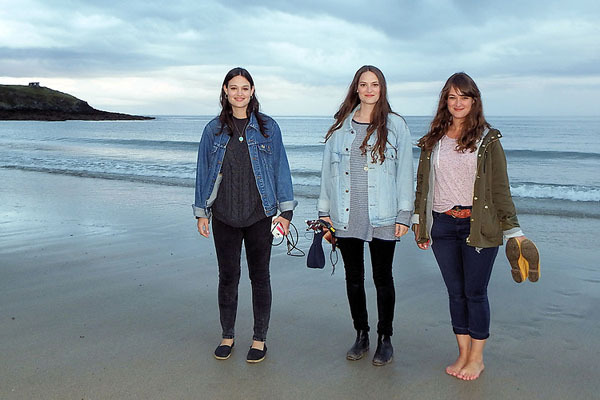 Twitter reports also tell me that The Staves ended the evening with a lovely acapella song inside the beach hut. If only we’d stayed! We’re still kicking ourselves for leaving, but weather aside it really was an evening to remember. Images: Kate Ardron, Sally Mitchell, Mary Alice Pollard, Nokia.